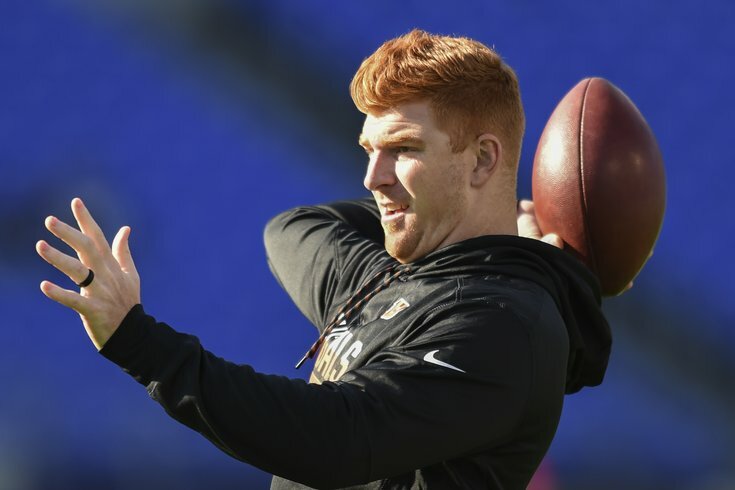 Has anyone noted yet that Eagles vs. Bengals is the battle of the ginger quarterbacks? If not, I would like to do so here. On Sunday, the Philadelphia Eagles will travel to Cincinnati to take on the struggling Bengals in what is probably the least-hyped Eagles game of the season. For those of you still interested in what happens in the game on Sunday, here are five matchups to watch. The Eagles' cornerbacks have had a rough season although, in fairness, it seems like they're facing an elite wide receiver every week, like Odell Beckham Jr. Dez Bryant, Jordy Nelson, Julio Jones, Terrelle Pryor, Antonio Brown, etc. Why can't the Eagles' pass rushers get to the quarterback? Who will be the Eagles' cap casualties after the 2016 season? The Bengals have an elite wide receiver of their own in A.J. Green, who will not play. After Green, the Bengals' top two receivers are Tyler Boyd and Brandon LaFell. Boyd is a promising rookie, but certainly not anywhere near as good as the players noted above, while LaFell is now 30-years old and on his third team. The Bengals' passing attack has struggled mightily the last two games without Green. Andy Dalton's numbers without him: 50 of 91 (54.9 percent) for 490 yards (5.4 YPA), 2 TD, 2 INT, 68.5 passer rating. Hey look, a lack of quality weapons in the passing game can hurt the quarterback's performance. Who would have thought? As for Dalton, the Eagles also get a reprieve from quarterbacks who can kill you with their feet, as they have faced Russell Wilson and Aaron Rodgers the last two weeks. "You know, he's not as mobile and is not as much of a threat as the last couple guys we played but he can still make a lot of scramble plays," said Jim Schwartz. "I'd probably put him a little bit more in the Kirk Cousins range when it came to that. That's not his main objective, but he can still make you pay if you're out of your pass rush lanes or read option stuff, things like that. I think he's a very efficient quarterback. He doesn't make a lot of mistakes. "He takes what the defense gives him. He doesn't make a lot of bad decisions. I think that he's one of those guys that he had -- obviously A.J. Green was a difference-maker for him. Had a lot of confidence in him throwing the ball up. [Dalton didn’t have] Eifert early in the season, but now he has him. He has some trust in those guys but he's a guy that recognizes things pretty quickly and tries to take what the defense gives him. We have to take his first look away. We have to be able to take that away and be able to force him to hold it a little bit longer and try to make him make some un-wise decisions, trying to make him fit some tight throws in there. If we can do a good job of that, I think we can have a good day." With Green out, the Bengals' best weapon in their passing game is tight end Tyler Eifert. A season ago, Eifert was a force in the red zone, scoring 13 touchdowns, which was fourth-most in the NFL. At 6'6, 250, Eifert does a great job using his size, as many of his touchdowns were simply highly thrown balls that he went up and got over opponents. This season Eifert has missed time, playing in just five games. In those five games, he has caught 21 passes for 312 yards and 2 TDs. Eifert is less of a threat in between the 20's, but he is clearly the Bengals' primary target once they get in the red zone. This past offseason, the Bengals lost RT Andre Smith in free agency to the Minnesota Vikings, and 2015 first-round pick Cedric Ogbuehi has filled in. Ogbuehi has been a significant liability all season for Cincinnati. A week ago against Green Bay, the Packers opted to often double Fletcher Cox, daring the other Eagles' defensive linemen to beat one-on-one blocks, which they could not do. In an otherwise terrific season, Brandon Graham had what I would consider his worst game of the season. The Eagles will need him to bounce back and take advantage of a favorable matchup on that side of the line. Defensively, the Eagles put their two best defensive linemen -- Brandon Graham and Fletcher Cox -- up against the right side opposing offensive lines to take advantage of favorable matchups. The Bengals do the same thing with their best defensive linemen, Geno Atkins and Carlos Dunlap. Also like Graham and Cox, Dunlap and Atkins are very disruptive despite a lack of eye-popping stats. On the season, Atkins has 4.5 sacks while Dunlap has 6.5 sacks. Allen Barbre and Brandon Brooks will have their hands full this week. And as usual, we'll point out special teams, where the Eagles are still the No. 1 ranked unit in the NFL by Football Outsiders.com. The Bengals are ranked 25th. One player of note is kicker Mike Nugent, who has stunk this season, quite frankly. Nugent is 18 of 23 (78.3 percent) on his field goal attempts, and he has missed four PATs.